Dr. Paul Spong's (and Helena) Orca Lab is the provider of orca-live, a web-site dedicated to the Northern Resident Orca Whales. 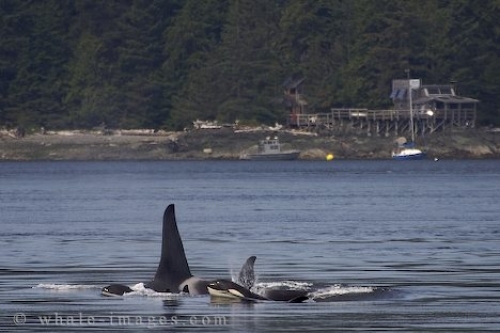 This picture shows the A30's (resident family pod) in Front of the Orca Lab on Hanson Island. Photo of the resident Orca Whale pod A30 and Orca Lab on Hanson Island in the background, British Columbia, Canada.